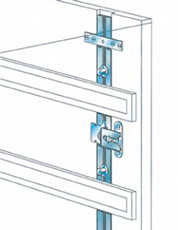 Lock is sidemounted in the drawer front. Minimizes interference with hanging files. Full 1/2" lockbar throw. Fits within 1/2" drawer slide clearance. Minimal machining required - only a hole for the lock and a groove for the lockbar is needed. Cast aluminum secret gate latch. Features interchangeable left or right hand mounting.